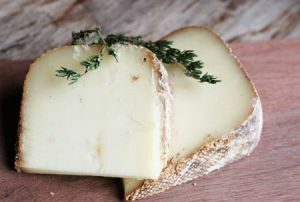 Abbaye de Belloc is a French, traditional farmhouse, semi-hard cheese from the Pays Basque region, made from unpasteurized sheep milk, with a fat content of 60%. The cheese was first made by the Benedictine monks of the Abbaye de Notre-Dame de Belloc, at the commune of Belloc in the Ariège department of southwestern France, from milk from the local flocks of sheep. Abbaye de Belloc is made in a 5 kg fat wheel with a natural, crusty, brownish colored rind with patches of red, orange and yellow. The cheese was founded by Benedictine monks. For centuries they have made their cheese from milk produced in the locality. The cheese has a firm, dense, rich and creamy texture. The taste resembles burnt caramel and there is a distinctive lanolin aroma.